As air pollution in Tehran reaches dangerous levels - a result of thermal inversion - the city becomes a deadly place for its residents. Niloofar (Sahar Dowlatshahi) lives with her elderly mother in Tehran. When doctors insist that her mother leave Tehran for her respiratory health, Niloofar’s family decides that, as she is unmarried and has no children, she should also move away. However, Niloofar has a life in Tehran that she does not want to leave. She runs a busy alterations shop and is in the heady early days of a new relationship. Torn between family loyalty and her own desires, Niloofar decides that the time has come to stand up for herself. The first scenes of Inversion depict a city choked by smog. The impact of Tehran’s poisonous air dominates Behnam Behzadi’s insightful and gripping film - creating a claustrophobic atmosphere that matches Niloofar’s desperate predicament. For despite seeming remarkably liberated, beneath the surface she is trapped by duty and cornered by familial responsibility. That Niloofar should have desires of her own is treated with cruel contempt by her family. For her life as an unmarried woman has no value in her society and independence comes at a very high price. Niloofar risks losing everything - her family, her relationship and her business. 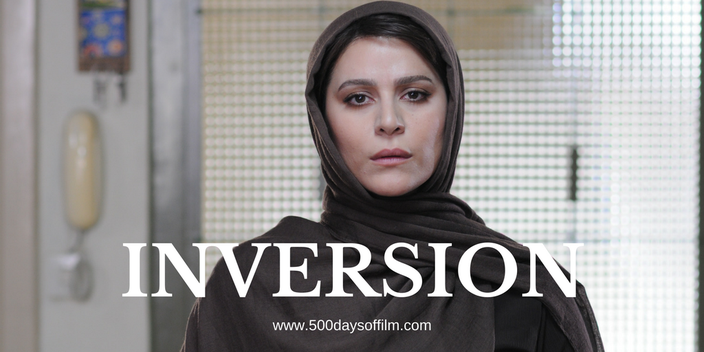 Inversion is a compelling and thought-provoking film. The consequences of Tehran’s air pollution are shocking, providing Behzadi with the perfect backdrop by which to tell Niloofar’s story. It is thanks to Sahar Dowlatshahi’s wonderful, engaging performance that we care so much about her future. She shows impressive strength without seeming selfish or unreasonable. Meanwhile, Niloofar’s resilience in the face of such stifling oppression is undeniably inspiring. As a result of this and her immense likeability, we wish Niloofar a happy ending. While, of course, Behzadi cannot give her story a fairytale conclusion, there is hope and the possibility of freedom. If you have, what did you think of this film? Let me know by leaving me a comment in the section below. Alternatively, do get in touch via Twitter or Facebook!